Product #20761 | SKU SDXCF | 0.0 (no ratings yet) Thanks for your rating! 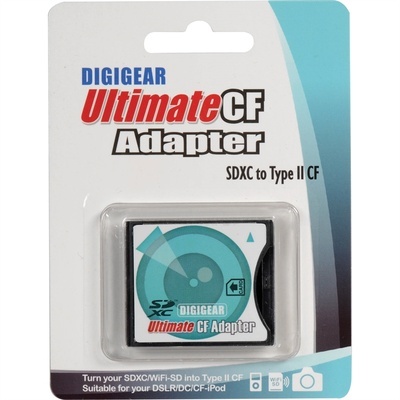 The Digigear Extreme SD-HC-XC to CF Adapter is a Type II memory card adapter ready for SD 3.0. It can support the new exFAT file system on Windows OS. This adapter is also equipped with high-speed CF interface and the access rate is faster than virtually any similar products. The SDXCF supports converting SDHC, SD, miniSD (with adapter), microSD (with adapter), MMC, RS-MMC (with adapter), and even the next generation SD 3.0 card with exFAT file system to Type II CF. Equipped with the high-speed CF interface, this adapter will not slow down the access rate of the inserted media, but will also not accelerate it. The SDXCF is compatible with many digital devices equipped with a CF Type II socket, including select UDMA digital cameras and DSLR's, PDA's, digital photo frames, card readers, notebooks and more! Get the power of an SD card in your digital devices. The adapter supports the Windows 7, Vista, XP, Mac OS and Linux operating systems.